Are the checkboxes actually useful? You can just rely on the tabs in the Advanced Device Selection window. If it takes too much time to scan everything (I doubt so), then the listviews in the tabs can be filled in lazily by Anaconda the first time a tab is selected. The checkbox meaning multiple things (install on and any other drives you'd like to be automatically mounted to your system) is very confusing. For the simple device selection, you could scan all drives and show the device selection before the mount point selection (or maybe not show it at all and, again, present all drives); remember that in most cases just one or two drives will be shown. For the advanced device selection I can only think of showing the device selection twice---once before scanning for existing systems, once before defining the mount points. I don't know however if it makes sense to have multiple tabs if you can just choose one item from one of them. A dropdown instead of the tabs is more intuitive in this case. On the other hand, showing the same dialog twice, once with a dropdown and once with tabs, is definitely a bad idea. If you show the device selection dialog twice the dropdown would be unnecessary. OTOH in the simple installation case it is probably better to keep the dropdown and have only one simple device selection step after the partitioning scheme has been selected. In any case, the dropdown would be moved above, since there you choose which disk would be wiped (right?). device(s) is ugly. Just use devices. Does "Replace existing Linux systems" wipe all partitions or only the root? That's not clear. The radio button should be disabled if there are no existing Linux systems. Rename Use Free Space to Use All Free Space. Remove assuming you have enough free space available. and disable the radio button if not enough free space is available. Likely, disable the shrink system radio button if there are no partitions in the chosen boot device, etc. The "tip" is presented twice. Make it appear in the bottom only when the appropriate radio button is checked. Does a message box appear to confirm if one of the data-destroying options is chosen? What is the default choice? If the above suggestion of disabling radio buttons is implemented, the options should be reordered so that the default choice is always the first enabled radio button. In the simple case (such as https://fedoraproject.org/w/uploads/thumb/1/19/Anaconda_devselectsimple_3.png/800px-Anaconda_devselectsimple_3.png) drives are "mounted". "Please select the drives you'd like to install the operating system on and any other drives you'd like to be made available automatically." 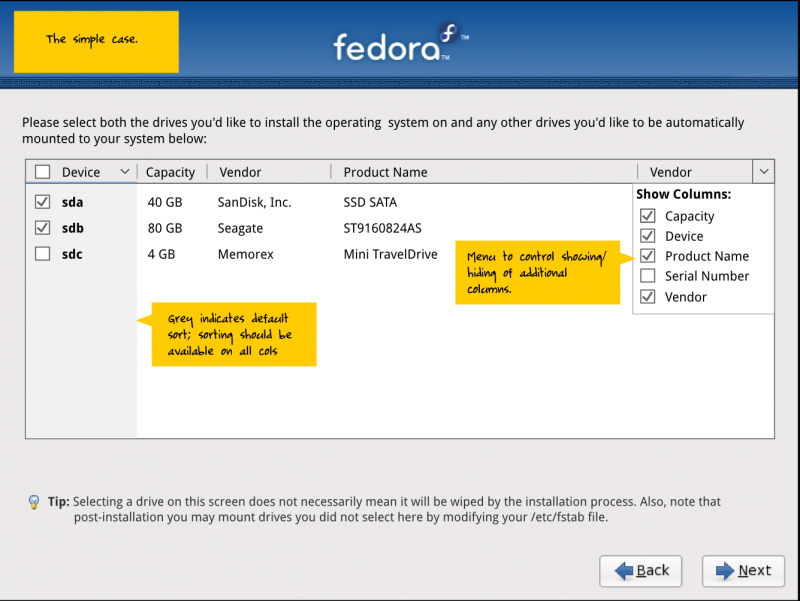 "Select the drives the operating system is installed on, and select any other drives that are connected ('mounted') automatically on every boot." This page was last edited on 15 September 2009, at 14:28.